Shares in M2 Cobalt Corp (CVE:MC) were off to the races on Wednesday after the company announced the acquisition of exploration licenses in east Africa and resumed trading in Toronto. During lunchtime trade the Vancouver-based junior was exchanging hands for $1.00 up 61.3% after a halt on trading on the TSX Venture Exchange in place since November was lifted. Around 67,000 shares were traded giving M2 Cobalt a market value of $25m. The company, which changed its name from Accend Capital in November, in a statement said it acquired seven exploration licenses in the Republic of Uganda spanning roughly 1,564 square kilometers. M2 Cobalt issued 19.7m common shares to the licence holders plush cash payments totaling $1.1m. M2 Cobalt raised $8.5 million from investors at the beginning of the year to finance the purchase noting that "market interest in the offering was strong and greatly exceeded the company's minimum offering of $4m". 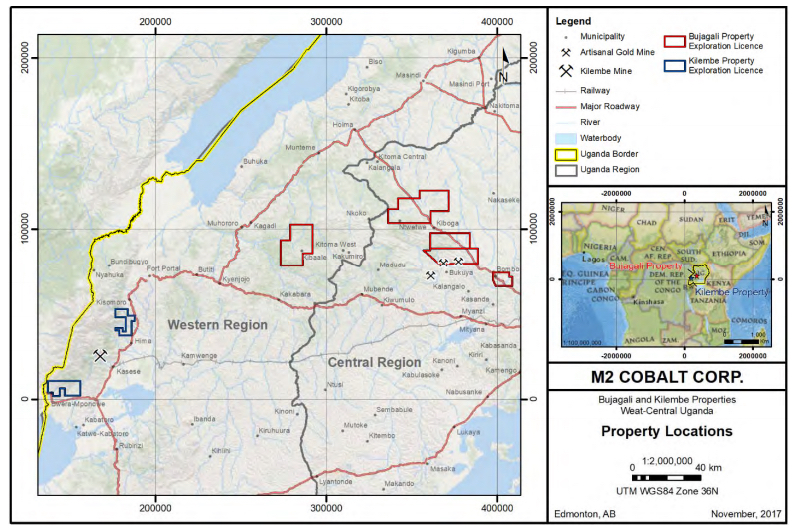 M2 Cobalt also announced management changes including a new director for its east Africa operations and said it's embarking on an extensive exploration program for cobalt and related minerals on the Bujagali and Kilembe properties to build upon historic work done in the region. Cobalt prices went ballistic in 2017 with the metal quoted on the LME recently topping $80,000 a tonne after more than doubling over the past year. The rally was sparked by intensifying supply fears and an expected demand spike from battery markets. Measured from its record low hit in February 2016, the metal is more than $50,000 more expensive. Annual production of the raw material is only around 100,000 tonnes with the bulk coming from the Democratic Republic of the Congo, where fears about political instability and the challenges of ethical sourcing combine to supercharge supply concerns. According to S&P Global today six of the top 10 cobalt mines are in the DRC. Due primarily to Chinese investment by 2022 the central African nation will host the nine largest cobalt producers. Primary cobalt mines are scarce – more than 90% of global production is as a byproduct of copper and nickel mining. Top cobalt miner Glencore in December announced it's restarting production at its Katanga copper and cobalt mine in the DRC and recently commissioned a study to measure the impact of the booming EV and energy storage market would have on mining. Based on an EV market share of less than 32% in 2030, forecast metal requirements are roughly 4.1m tonnes of additional copper (18% of 2016 supply). The move away from gasoline and diesel-powered vehicles would need 56% more nickel production or 1.1m tonnes compared to 2016 and cobalt supply would have to triple to 314,000 tonnes.